Former Democratic vice presidential candidate and Peace Corps founder Robert Sargent Shriver Jr. died today at age 95. Sargent Shriver was surrounded by his five children and 19 grandchildren when he died in a Washington-area hospital this evening. Shriver, who suffered from Alzheimer's disease in his final years, had been an advocate for the poor and powerless who helped launch President Lyndon Johnson's War on Poverty and became the driving force behind social programs such as Head Start, Legal Services and VISTA. "Over the course of his long and distinguished career, Sarge came to embody the idea of public service," President Barack Obama said in a statement. 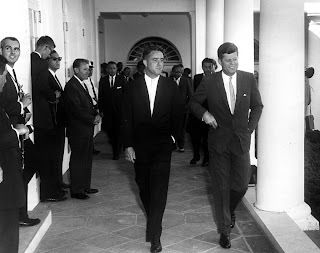 To read an interview of Sargent Shriver from May 6, 1963 -- go here.